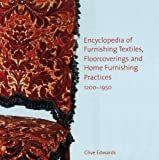 An essential work of reference for students, historians, curators, textile designers, interior designers, conservators and collectors, the Encyclopedia of Furnishing Textiles is an accessible and comprehensive reference work describing the furnishing textiles, soft furnishings and floor coverings used in Western domestic interiors over the period 1200-1950. It includes nearly 1200 entries covering generic topics such as: woven textiles, printed textiles, embroidered textiles, tapestry, painted cloths, yarns, dyes, carpets, rugs, non-woven fabrics, oil-cloths, wall materials, upholstery materials, loose covers, trimmings (passementeries), beds, cushions, and many more. Clive Edwards is a Reader in the History of Art and Design at Loughborough University. After a career in the retailing of furniture and interiors he took an MA in the History of Design at the Royal College of Art/Victoria and Albert Museum and subsequently completed a PhD on Victorian furniture technology. His publications include monographs on aspects of furniture technology, materials and trades, furnishing textiles and the retailing of domestic furnishings, as well as contributions to multi-authored works on interiors, architecture and home furnishings.